Mark Donaldson was born in Waratah, Newcastle, NSW on 2 April 1979. He spent his formative years in northern NSW where he graduated from high school in 1996. Trooper Donaldson enlisted into the Australian Army on 18 june 2002 and entered recruit training at the Army Recruit Training Centre, Kapooka, NSW. He demonstrated an early aptitude for soldiering and was awarded the prizes for best shot and best at physical training in his platoon. Subsequently he was allocated to the Royal Australian infantry corps and posted to the school of infantry at Singleton, NSW, where he excelled in his initial employment training. At the completion of this training he was again awarded best shot and best at physical training, as well as the award for the most outstanding soldier in his platoon. He was posted to 1st battalion, Royal Australian Regiment, Townsville, QLD in November 2002. It was during this time that Trooper Donaldson decided to pursue his ambition to join the special air service regiment. In February 2004, he successfully completed the Special Air Service Regiment selection course and was posted to the regiment in may 2004. He was then posted to I Troop, 3 Special Air Service Squadron. Since that time he has been deployed on operations to East Timor, Afghanistan and Iraq. On 12 August 2008, Trooper Donaldson was wounded in action whilst conducting nightime operations in Oruzgan Province, Afghanistan. He recovered from his minor wounds and continued on the deployment. 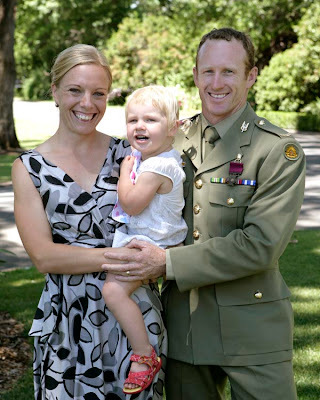 Trooper Donaldson was involved in an incident on 2 September 2008 in Oruzgan Province, Afghanistan that resulted in him being awarded the Victoria Cross for Australia. On 2 September 2008, during the conduct of a fighting patrol, Trooper Donaldson was travelling in a combined Afghan, US and Australian vehicle convoy that was engaged by a numerically superior, entrenched and coordinated enemy ambush. The ambush was initiated by a high volume of sustained machine gun fire coupled with the effective use of rocket propelled grenades. Such was the effect of the initiation that the combined patrol suffered numerous casualties, completely lost the initiative and became immediately suppressed. It was over two hours before the convoy was able to establish a clean break and move to an area free of enemy fire. In the early stages of the ambush, Trooper Donaldson reacted spontaneously to regain the initiative. He moved rapidly between alternate positions of cover engaging the enemy with 66mm and 84mm anti-armour weapons as well as his M4 rifle. During an early stage of the enemy ambush, he deliberately exposed himself to enemy fire in order to draw attention to himself and thus away from wounded soldiers. This selfless act alone bought enough time for those wounded to be moved to relative safety. As the enemy had employed the tactic of a rolling ambush, the patrol was forced to conduct numerous vehicle manoeuvres, under intense enemy fire, over a distance of approximately four kilometres to extract the convoy from the engagement area. Compounding the extraction was the fact that casualties had consumed all available space within the vehicles. Those who had not been wounded, including Trooper Donaldson, were left with no option but to run beside the vehicles throughout. During the conduct of this vehicle manoeuvre to extract the convoy from the engagement area, a severely wounded coalition force interpreter was inadvertently left behind. Of his own volition and displaying complete disregard for his own safety, Trooper Donaldson moved alone, on foot, across approximately 80 metres of exposed ground to recover the wounded interpreter. His movement, once identified by the enemy, drew intense and accurate machine gun fire from entrenched positions. Upon reaching the wounded coalition force interpreter, Trooper Donaldson picked him up and carried him back to the relative safety of the vehicles then provided immediate first aid before returning to the fight. On subsequent occasions during the battle, Trooper Donaldson administered medical care to other wounded soldiers, whilst continually engaging the enemy. 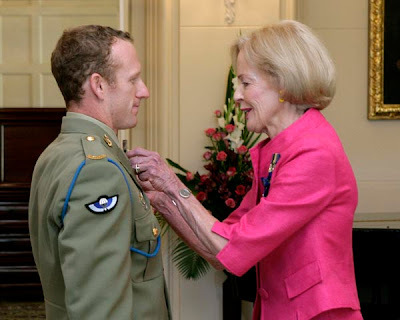 He was invested by her Excellency the Governor-General of Australia at Government House, Canberra on 16 January 2009. Trooper Donaldson remains posted to the Special Air Service Regiment in Perth, WA. Thanks for posting this - and heartfelt gratitude towards this fine Australian warrior. Nice bit of writing. You did research and write this yourself, didn't you Trev? Fair point anon-it was sent to me late last night with no credit. I have added the credit this morning together with additional information on how the medal was earned. That's a bit disappointing in light of the claim at top-right (just below the orange "Donate" button) that "the information contained on this blog is the result of more than 20 years of research, interviews, travel and hard work. New Zeal releases information found nowhere else." Chill out, Anon. It's nice to have 'passed-on' information in the same convenient place as Trevor's researched items. Top bloke, that Mark Donaldson.